You guys, I’m calling it – this palette was the best money I spent in the past years (make-up-wise, to avoid sounding too shallow). I’m so happy I took the plunge and got it. This is definitely not the new eyeshadow palette by Kat Von D but it’s definitely new to me. After so much hemming and raving, I caved in and bought it. The colour range is versatile, mainly because there are more useful lid shades for my skin tone and eye colour, and I love every single shade in this palette. The pigmentation of this palette is outstanding, they apply and blend so nicely. It’s worth the hyped in my opinion. Inside Monarch you get twelve warm-toned eyeshadows as well as a mirror and they are all encased in a heavy duty, sturdy cardboard magnetized palette. The colors are highly pigmented, but buildable, and they blend like a dream. This palette comes with 3 base shades and 9 accent hues. Smooth, buttery texture that’s easy to blend. Shadows wear well without creasing or fading. Attractive colors that work well in a variety of combinations. A little chalky on the formula when I did the swatch but I didn’t notice anything terrible happening on lids. Color swatch on my bare hands (without eye primer). Entomology is a is a matte cream. Wrath is a coppery orange with pearl. Papilio is a medium chocolate with pearl. Summerfly is a glittery gold. Telepathy is a pale champagne pearl. Killing Jar is a pale pink/copper pearl. Delaney is a silver/grey with pearl. Vanish is a light taupe matte. Tiny Death is a cream with fine gold glitter. Disintegration is a brown with pearl. Shadow Box is a dark chocolate brown matte. Deadhead is a black matte. I found nearly all of these shades to be super soft, finely milled and very pigmented. The first four are stunning all together. The second four are all also nicely pigmented but have a lighter finish for a softer look. The final four are mostly deep and the two matte shades are not patchy whatsoever. Overall, I’m impressed and it’s totally worth the money. I have nothing bad to say about these shadows except with a minor fallout from Summerfly shadow. Otherwise, they are all standouts. I’d definitely love to get more of these Kat Von D Eyeshadow Palettes. If you haven’t tried any of it yet, I’d recommend this one. Thanks for taking the time to stop by and read. Hope to see you on the next one! Bye! Previous postQuestion Tuesday – Show & Tell Beauty Routine! 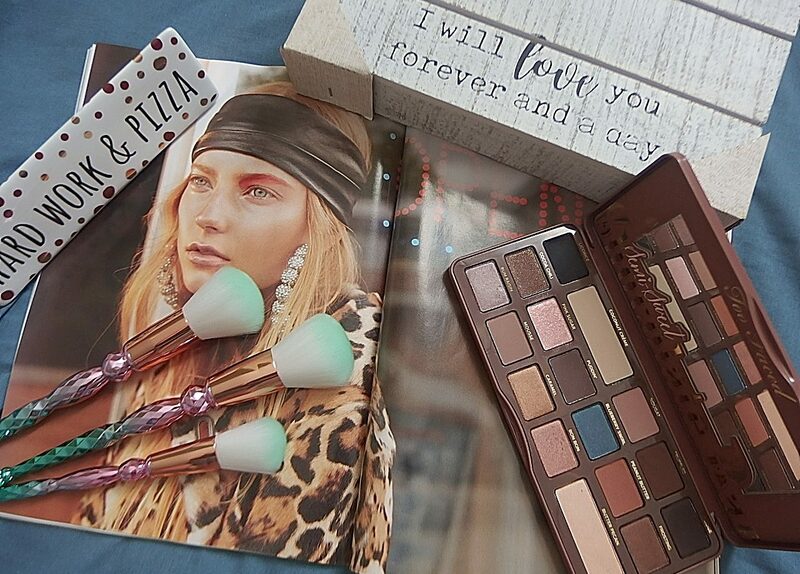 What a lovely palette! Love the swatches and eye look. I am obsessed with anything Kat Von so I’ve been eyeing this up! Such great shades, too!! I really like this palette on you, it is pretty. I really love butterflies so I have been eyeing this one for a while. They are easy to blend and pretty to wear. Glad you’re liking it. I’m sure you’d love it. I haven’t worn makeup in years, I just can’t justify the expense of the products. I will admit, the colors are pretty and they are the type of colors that I used to wear, but there is no way I would EVER pay $55.00 on eyeshadow alone! Could I justify another eye palette? this is so pretty! wouldn’t mind trying it myself! I have never seen this palette before so it was super helpful that you put the colors on your arm! I love it! Great review. I love the colors. Kat Von D makes some awesome eye shadows! I don’t have this palette but I have her shade & light shadow palette and I LOVE it! I am glad that this palette and shades are great for you…seems like good reviews from several blogs for this Kat Von eye shadows! Love the shades, these are definitely colors I would go for. Nice review! It looks great. I want to buy it..!